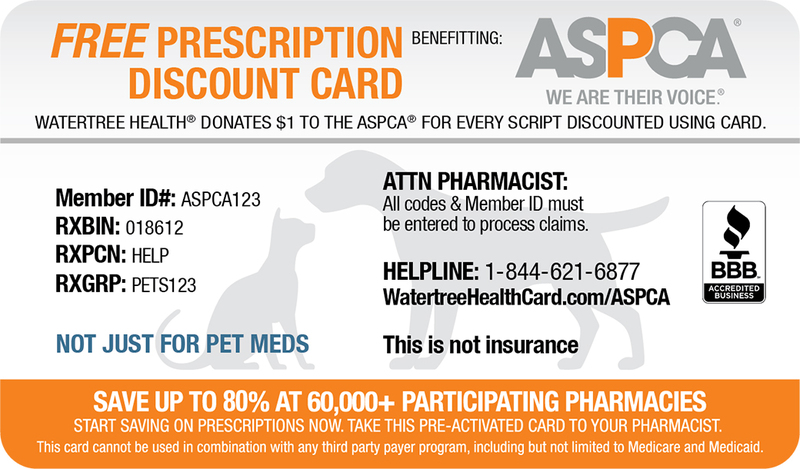 Watertree Health®, a provider of free prescription discount cards benefitting nonprofits, is proud to support the ASPCA’s mission to provide effective means to prevent cruelty to animals throughout the United States. Since the partnership formed in October 2016, Watertree Health has donated over $250,000 to help bring pets and people together to help promote healthier, more active lifestyles. The cards are accepted at over 60,000 pharmacies nationwide. All prescriptions are eligible, including pet prescriptions. Every time you use the card benefitting the ASPCA, Watertree Health donates $1 to our organization’s work on behalf of animals. In honor of Prevention of Cruelty to Animals Month, Watertree Health will donate an additional $1 ($2 total) for every prescription purchased using the card throughout the month of April. To get the card, visit WatertreeHealthCard.com/Happy-Tails or text ASPCA to 95577.